Fall! The crackle of leaves, the smell of mulled cider and the frenzy of feeding the family while still making it to the football game in time! We all know that as DoAhead’s the crock-pot is a virtual Holy Grail. But second to that it is a timed oven. Today we’ll use it to pursue our own version of “One Potato, Two Potato”! 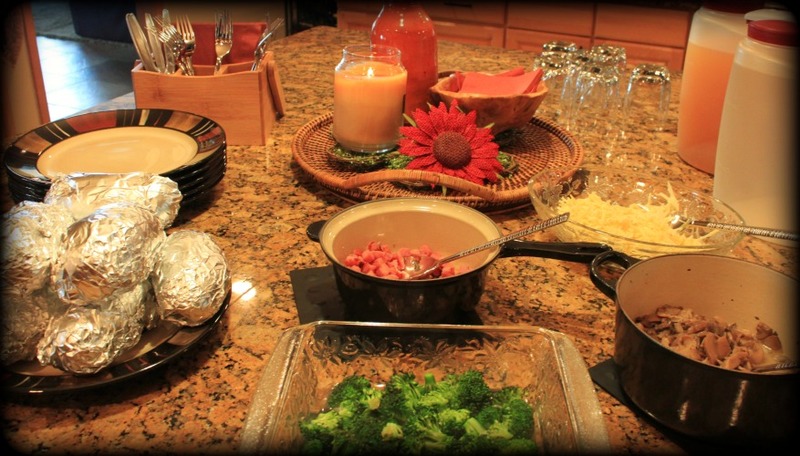 Drum roll please for the Baked Potato Bar! Clean and cut broccoli, steam for a couple of minutes prior to opening “the bar”. Diced ham, shredded chicken, or bacon are all good meat toppings. Splurge on heavy Chinet paper plates (they’ll withstand a loaded potato) so you can minimize dirty dishes. That’s it DoAhead’s! A “One Potato, Two Potato” trick to getting your team out the door and onto the field!